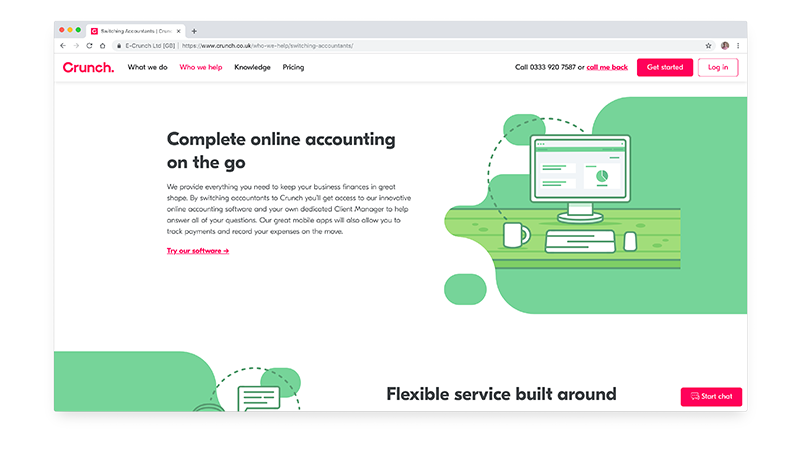 Having started life as an accountancy firm with software and accountants all in one place, Crunch designed its service to fit nicely with the contractor and freelancer market, specifically those trading through LTD companies. This all started in 2008 and the market has since evolved with many more competitors and a raft of market and tax changes since. It was time for a change, a regeneration if you will and a plan was hatched to extend Crunch’s reach with new add on services, packages for different size businesses and a whole new area for people just starting to think about starting their own business. Fully understanding the business’ desired outcomes and goals was key for my early discovery work. I set about conducting some informal interviews with key stakeholders and also broadened the fact finding using a questionnaire to other key individuals. 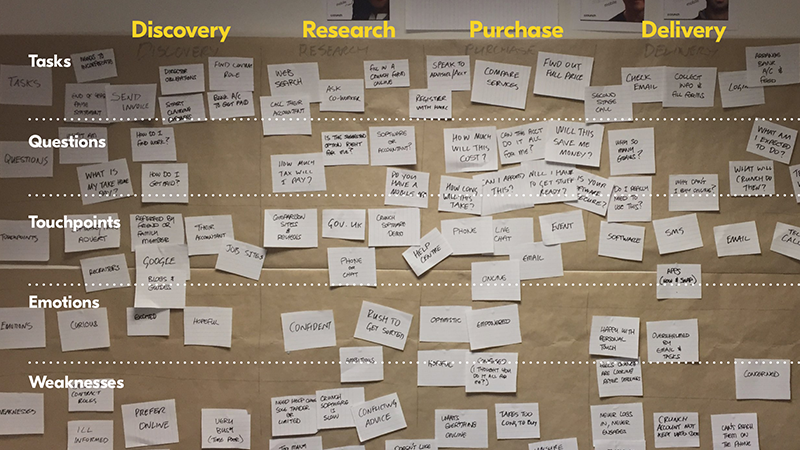 Asking questions like “How would you describe Crunch to a layman?”, “What markets do you see Crunch expanding into?” might seem obvious but asking that question across the business gave a good indication of how people understood the overall vision. Following with questions like “What competitive challenges do you face?” and “What are the main weaknesses of the business” were also able to offer some practical insight. By summarising these answers and interview notes, I was able to draw on them throughout the initiative and check against our direction. Running these sessions with key people in the business was an excellent way to learn more about prospective clients described above. 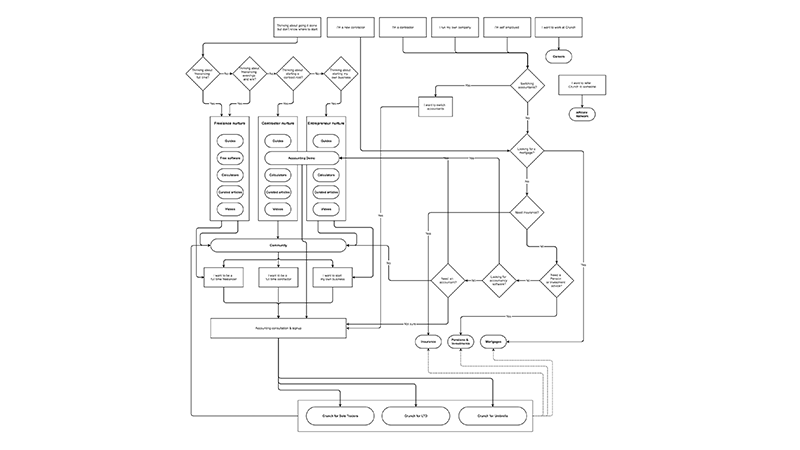 With this insight I gained some valuable understanding about the prospective client types and I was able to produce a visual decision flow that gave an indication of how people might move through the sometimes complex options of running a business or becoming a freelancer. 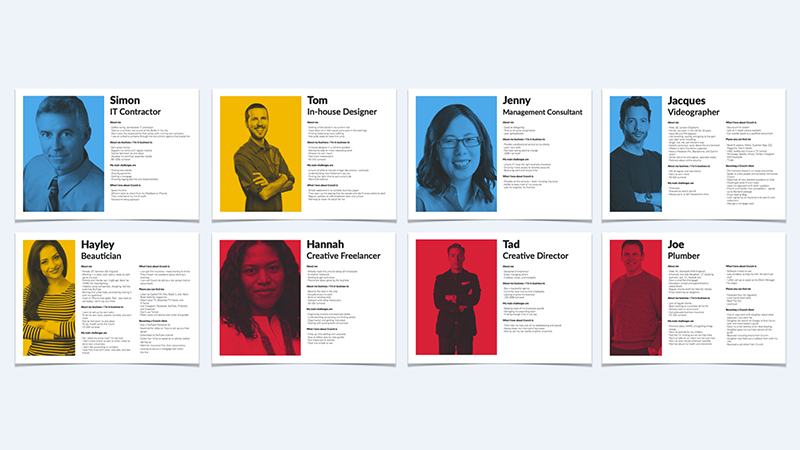 To support this further I created a set of prototype personas that we could use throughout the rest of the initiative, bringing our prospects and their pain points to life. 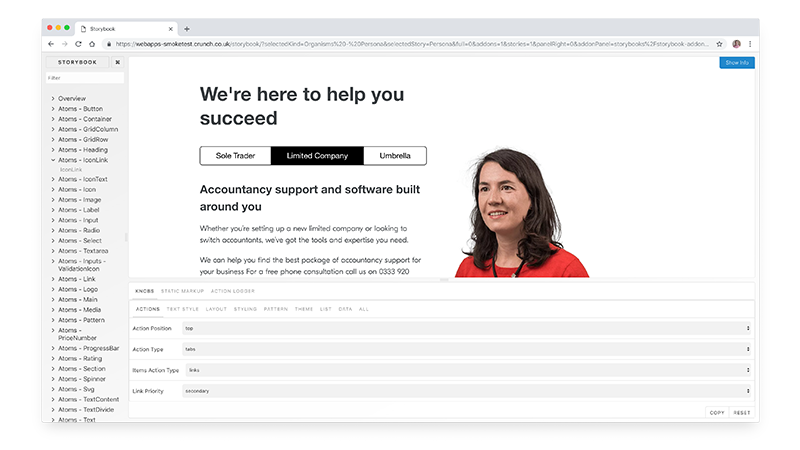 The next stage was to work alongside a UX designer, in this case we partnered with Leo from the Brighton based design agency Buffalo, and we explored ideas of how the website could be structured and how information might be organised on the pages. 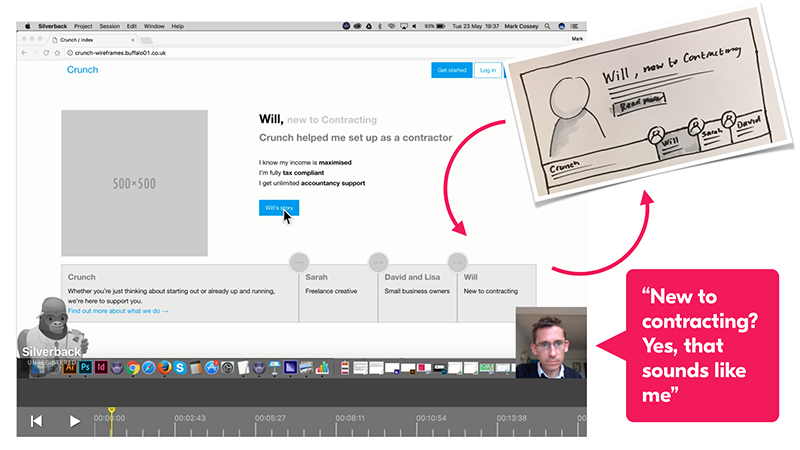 Once we were happy with a basic prototype, I tested the concept with a small group of users who matched or were in a similar situation to that of our personas i.e. thinking about going it alone or ready to make the leap. 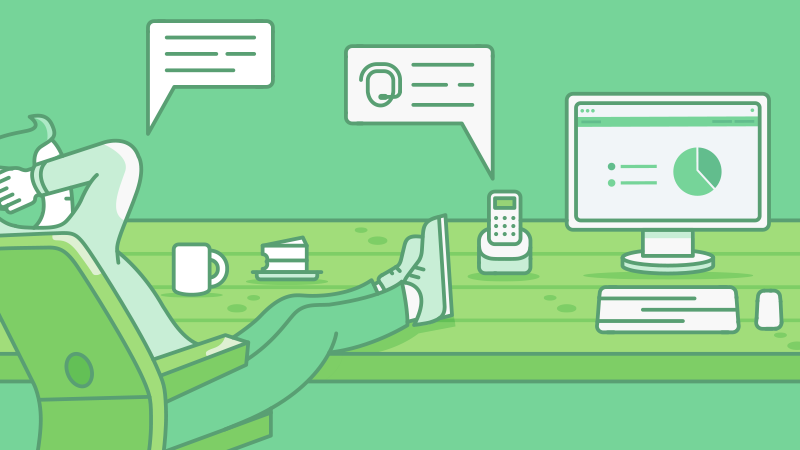 I was also able to test with internal key people as a way of gathering early feedback. As testing often does, we learnt that some ideas didn’t work as well as we thought but other ideas were more successful. An overabundance of CTAs proved to be problematic so we set about re-organsing page information to try and be more concise. We also learnt that using photos of real clients and sharing their stories was a good way for people connect to their own situation. The initial decision to do this was after a holistic evaluation of the Crunch homepage over time. An added challenge to this initiative was that Crunch were embarking on a re-brand at the same time as re-designing the website. We’d initially timed things so that the brand work would happen first, followed by the re-design but as things turned out, both were happening side by side. This gave us the opportunity to develop a visual style early and start to build out the component library using React, that would allow us to assemble the pages and content on the site. 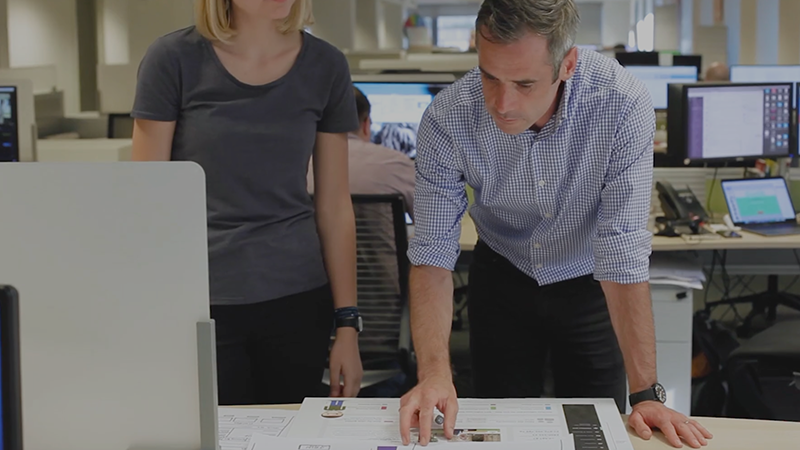 We’d made the decision to create a brand that was bold and distinctive, something that would convey our personality and enable us to stand out in a saturated market. Having big, crystal clear photos of our staff and real clients was a key part of the site and we supported this with a distinctive illustration style, again with the help of Buffalo. My in-house team have been able to develop this even further using the style in many different situations. Initiatives of this size bring plenty of learnings. 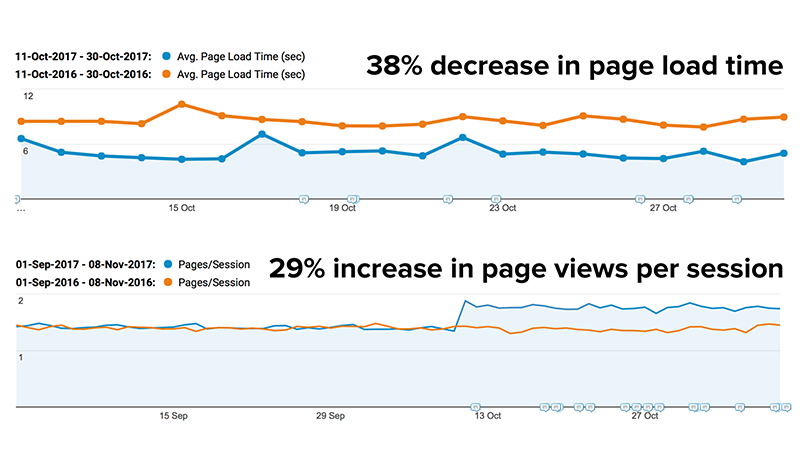 We saw an overall increase in the number of pages website users were viewing per session, and page load speeds on desktop devices improved dramatically. We did however see an initial dip in traffic over the first few months of site go live due to the culling of content and site restructure. With more improvements made to the site post launch we’ve see traffic and usage at record levels and site load performance has increased on mobile too. I'll keep this as brief as possible. I'm married with two daughters and when I'm not enjoying life with my family, I'm running, biking and (recently) swimming. I've taken part in too many running races to recall as well as 3 marathons, 2 triathlons and duathlon. Gardening offers me a sense of mental relaxation so I enjoy that a lot too. Personality tests often describe me as analytical and strategic and if pushed, my wife says I sometimes think too much.